Before diving into coconut opening, you want to take out the juice it contains. You’ll then avoid spilling it everywhere, and you’ll have all the juice saved on the side for drinking. Peirce the three little eyes of the coconut with a pointed tool (screwdrivers are usually ideal). Then empty the coconut of its juice. To cut it, grab a big thick knife such as a meat knife. Place the coconut in the palm of your hand, then hit it with a dry blunt from the back of the knife. Turn the fruit a quarter of a turn, and hit again. Repeat the operation (1/4 turn, hit) until the coconut breaks in half. The operation can take a few minutes, don’t loose hope! You will get a neat and aesthetic opening this way. Cut off pieces to make an exotic fruit salad with pineapple, mango, papaya etc, or to eat raw. You can’t wait to open your coconut and don’t have time for the previous method, way too long? 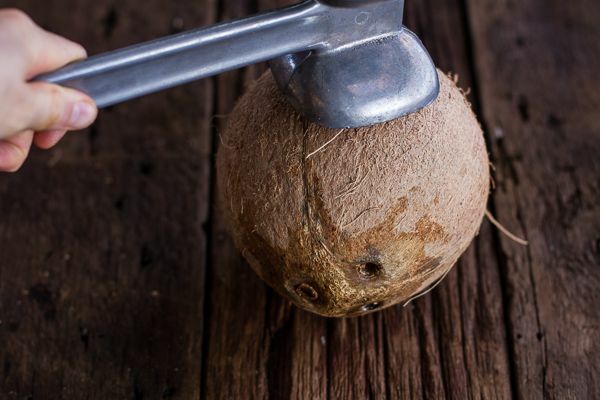 Arm yourself with a hammer to open you coconut very quickly. Here, the technique consists of aiming with a hammer the spot right in between the coconut eyes. With a powerful dry blow, the coconut should open on first try. It may however break into quite a few pieces, so keep kids and pets away and be careful. If all else fails, your dad or brother will be happy to show they have it in them. Here’s a coconut opening technique that’s even simpler, and less dangerous than the hammer. It just consists of throwing the coconut on a hard floor. For this method, make sure to empty the fruit of its juice, as described above. Outside of your house, choose a hard floor, like a step or a concrete terrace. Then throw the coconut high enough in the air so that it’ll hit the floor with speed. It should then open on impact. Obviously this is a slightly less elegant manner than the first one, but hey, it’s easy, it’s fun (I guess), and it means you can quickly dive into that coco goodness.